Okay, I take a lot of it back. 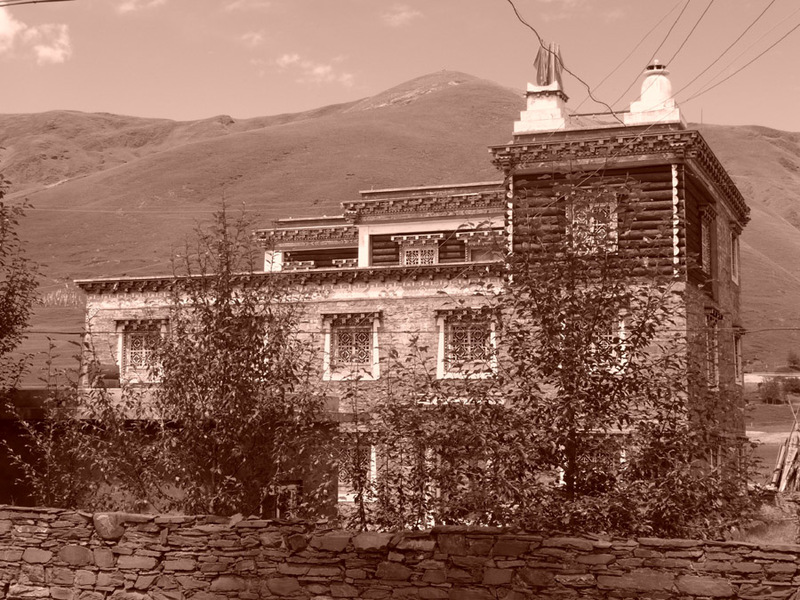 After that last letter, we arranged for the expensive truck, went out for spaghetti and meat balls again to get ourselves ready, came back to the hotel at 10:00pm to find Uncle Wangyal sitting in the lobby waiting for us. He had come in from 1.5 hours away out in the country for the second time that day, and said he had a truck. 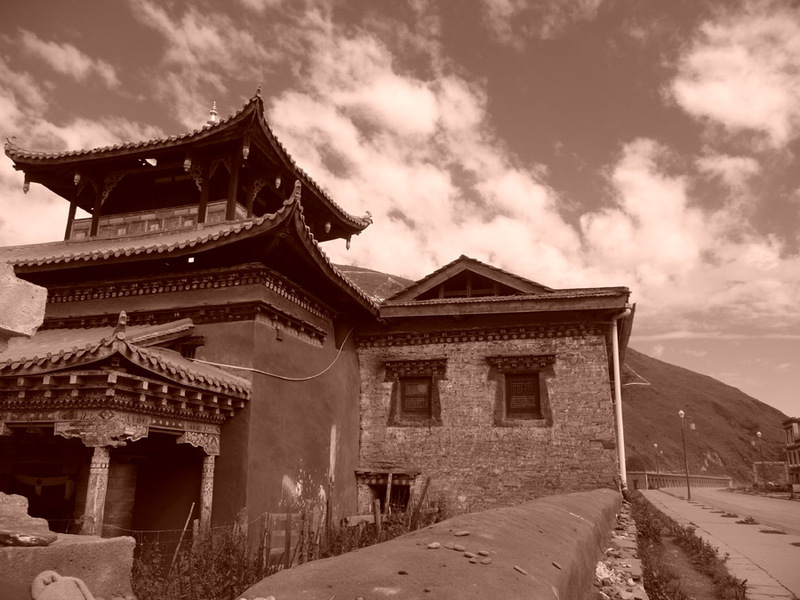 A young woman with a very beautiful face and abrasive voice got on her cell phone and starting yelling at God knows who, Jason (English nom de plume of our handsome hotel manager who I have a crush on) translated between Chinese and English, and after only 2 hours of yelling and the Tibetans’ phone ringing every two minutes (Jason: “My God, they’re busier than I am and I run a 145 room hotel!” Me: “They must be drug dealers–that’s the only explanation.”), it was decided that we would leave at 6:30 am with the new/old truck with a Chinese driver who was a friend of some one or other and spoke no English. During all of this fol-de-rol, the Tibetan dance troupe arrived back in full costume from a successful performance at the Intangible Culture Festival and ran exuberantly around the lobby leaping and singing Tibetan opera and punching each other in the arms. We left Chengdu at 6:30am on schedule and drove for 40 hours (usually takes 18 hours). We had to buck road construction for hours, a blinding snowstorm coming over a 16,000 foot pass, and a driving rainstorm with rain coming at us like crystal swizzle sticks. The driver kept talking to us in Chinese and looking at road signs, asking me where to go. 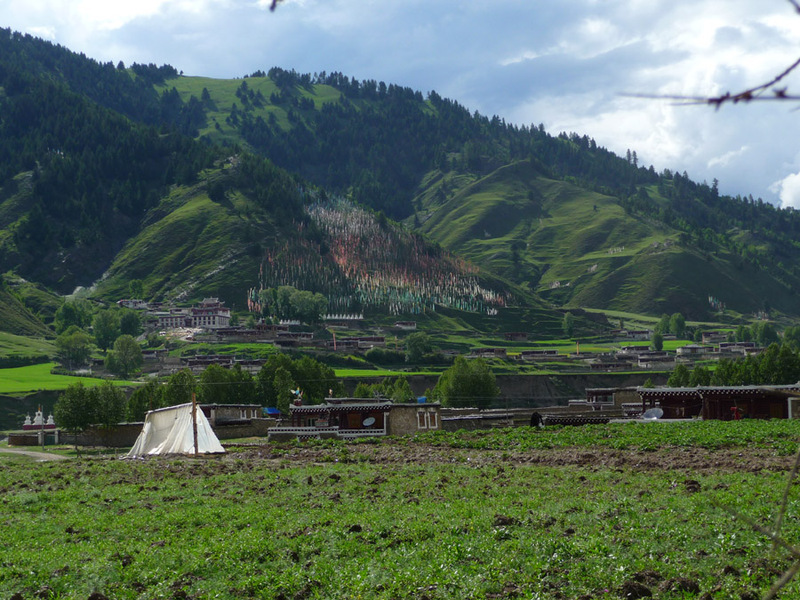 I had no idea, as I don’t read Chinese and couldn’t remember the way to Gansi–all yak herds were looking the same. 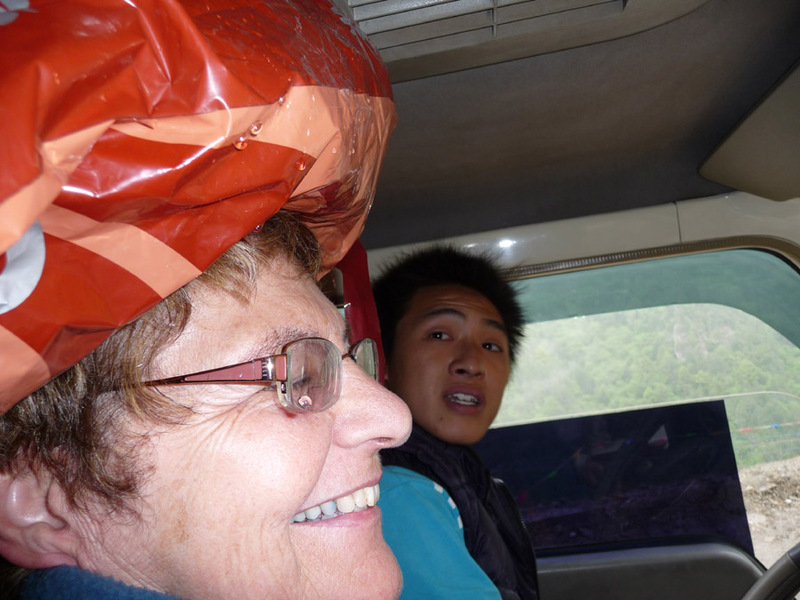 The fun nature of the trip was added to by a leak of freezing water coming in through the roof of the cab-right over Barb’s head. Being Barb, she gamely just wadded up a plastic bag and balanced it on her hair to ward off a potentially severe head cold. 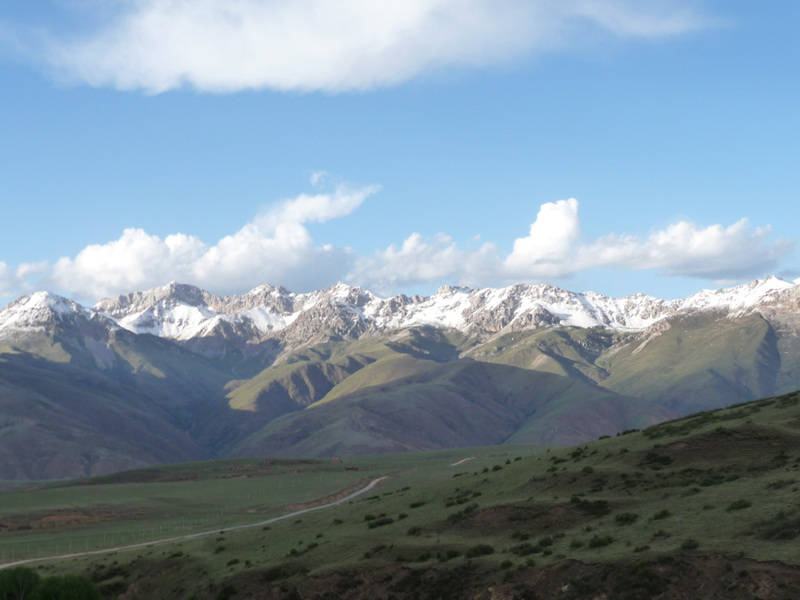 Finally we crossed the last high pass (Gye La Pass–4,290 m/14,075 ft) and descended into the fabulous Tagong grasslands (a bit snow-covered for our arrival, but grasslands none the same). We pulled into our hotel about 10:00pm, falling out of the cab and into the hugs of the hotel’s owner. I’ve been through here before and they are always a warm, inviting group, chattering away. 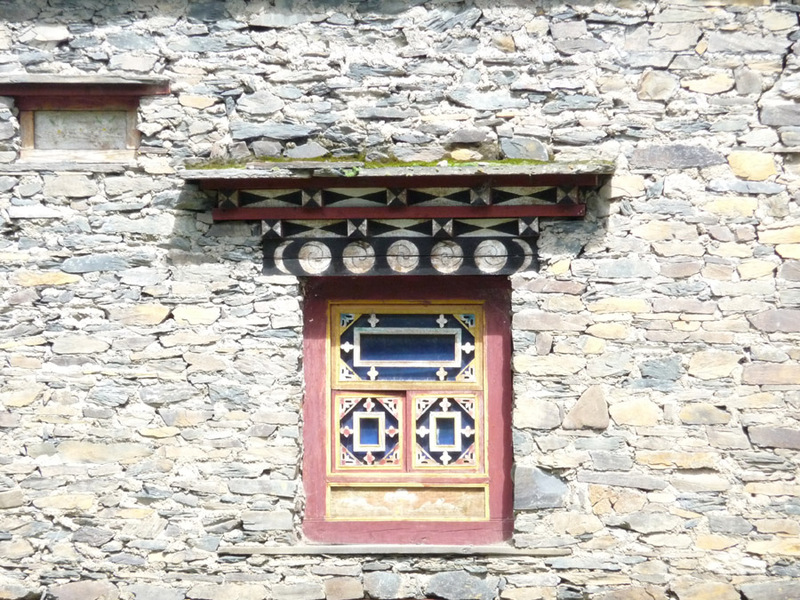 They showed us our rooms, and ran to the kitchen to start preparing a meal of thukpa (vegetable soup), rice, yak meat, potatoes–enough for a hungry party of forty, although we were the only guests. Early morning, we were on the road again, the potholes and mud slides hardly fazing us. In the fields were decorated ponies and people with red yard woven in their hair, topped off with big amber and ivory headdresses and huge chunks of turquoise hanging from their ears. 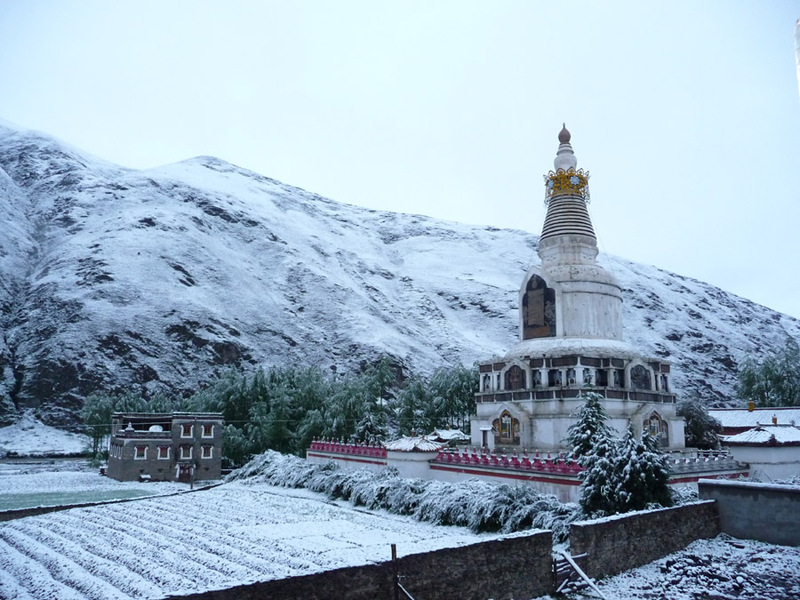 Snow covered the fields and the yaks in the meadows who also sported red yarn in their tails. 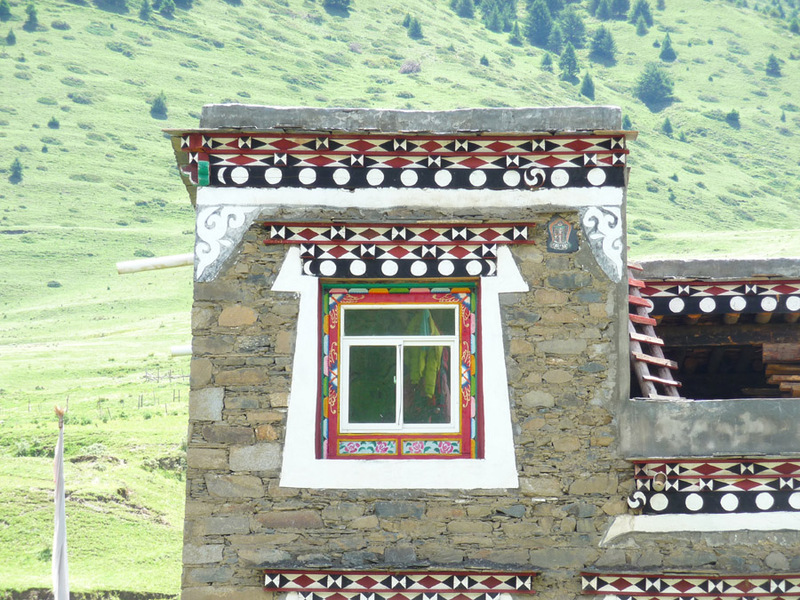 We passed the beautiful homes made of native stone–they have a crisp rich feel–and indeed the Tagong grasslands are known for their fertile fields and fine architecture. 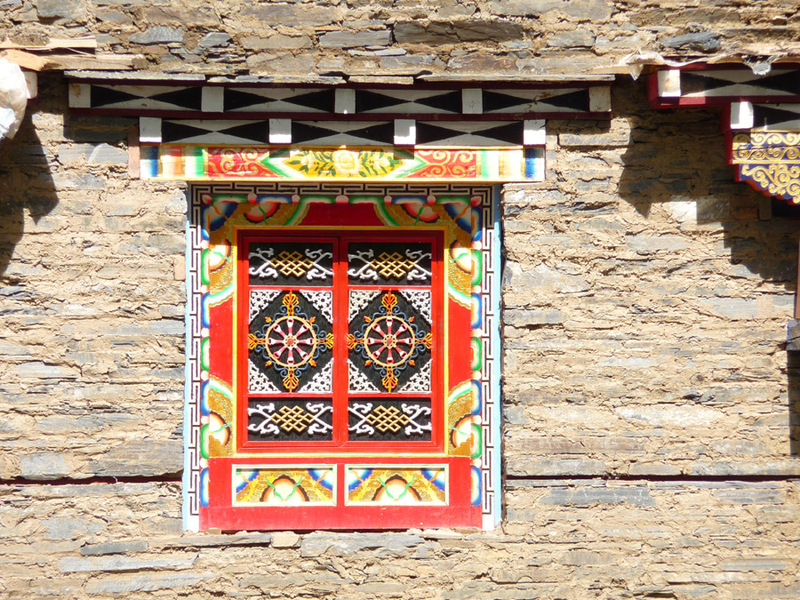 The Tibetan Plateau is known for its highly decorated windows and doors on stores, hotels, homes and monastic centers–designs include mountains, animals like the snow lion, flowers, leaves and the Eight Auspicious Symbols of Tibetan Buddhism. 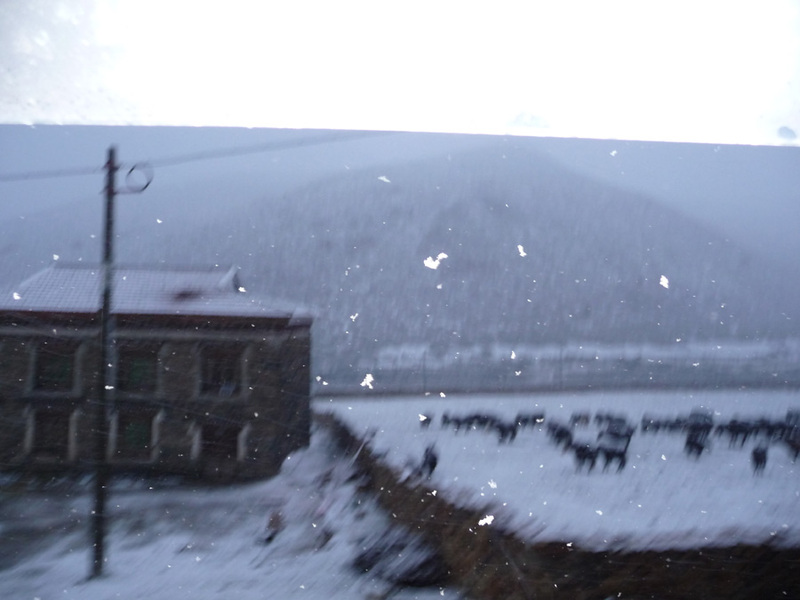 The snow gradually disappeared and the roads improved a slight bit, cheering us up immensely. There is nothing that makes your heart skip and speaks more to being in Tibet than rounding a bend in the road and seeing Om Mani Padme Hung (often spelled and pronounced by Westerners as Hum)–the Tibetan prayer to end suffering for all sentient beings painted on the hillside high above a village.
. . . or driving by a village and seeing prayer flags stretching up the mountainsides, fluttering in the wind, sending out these same prayers of compassion out into the universe. 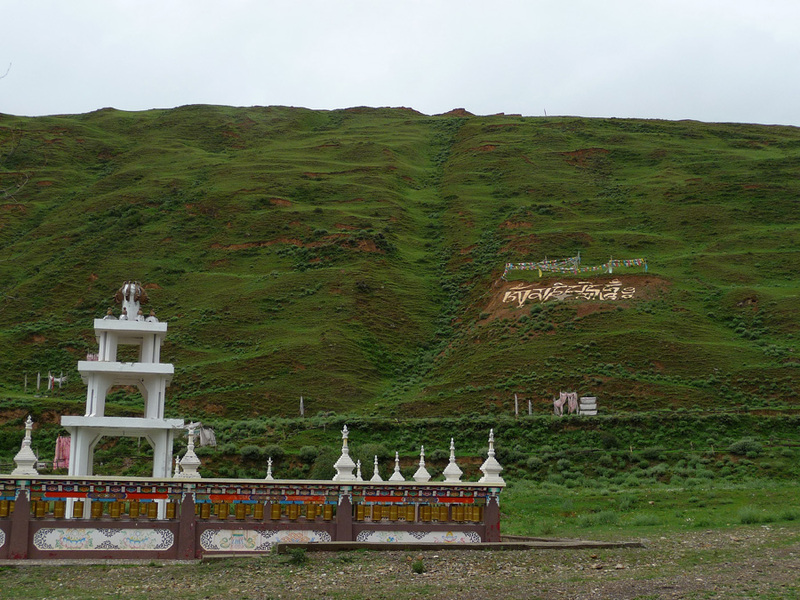 The weather began to clear before Tagong, where we stopped briefly at Lha-Khang Monastery, one of those shining examples that the Chinese Government has on display to show that all is well in the land of Tibetan Buddhism. I could be wrong about the public relations motivation on this one, but I have been there many times and have never seen more than a few monks on the grounds, and never heard or seen a ritual in progress. Hours later (9:00pm), after more hours of insanely inefficient 10km/hour road construction, we crossed the final pass that signaled we were almost in Gansi. It was just in time–we were all ready to crack. 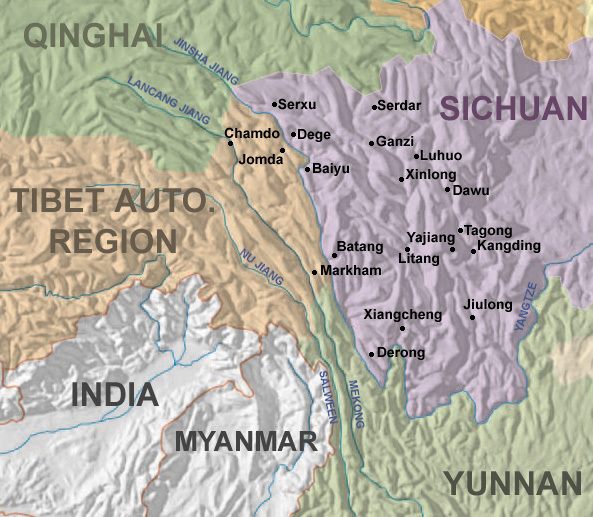 In the village of Oh Szang, a short drive beyond Gansi, we were greeted with tears and hugs by the villagers, and within minutes a fight with the driver had ensued because I had agreed to pay him more for the trials and tribulations of the trip and they thought I shouldn’t and insisted I not, hustling me into the house (We’ll take care of this!!”). Jason had been calling all day from Chengdu to track our progress (world’s most nurturing hotel manager) and got on the phone and talked to everyone while the driver and the villagers yelled. Finally, I had Jason tell the driver I would give him the agreed upon fare in front of everyone, he should accept it graciously, and I would slip the remaining $130 “tip” under his seat in the truck. 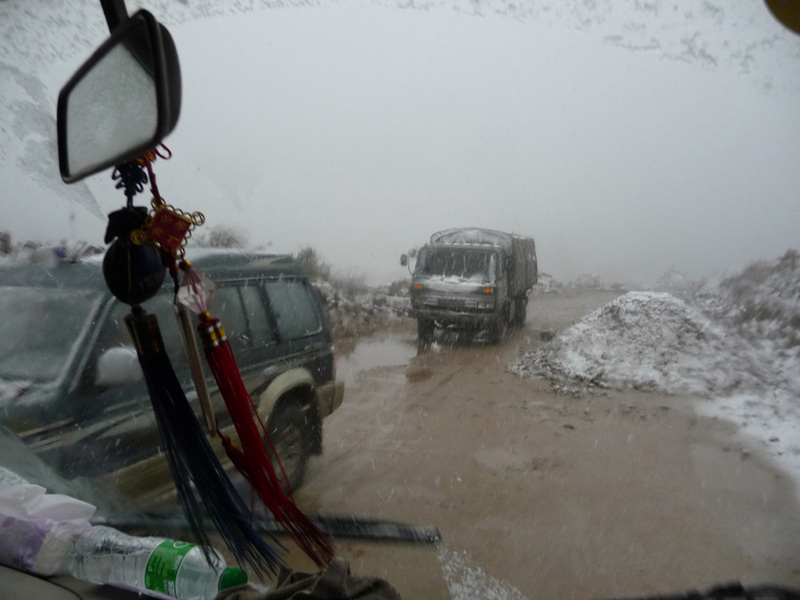 This came down with no further problems–we all went in the mud house to eat momos (including the driver), and be force fed with cookies and tea, and slept a sound sleep after being tucked in by Lhamo Choedon, my friend Ricnhen’s sister, and a woman who has become a friend like family over the last years. Today we put one of the fab tents up and Uncle Soega went off to town to negotiate for tent poles, spikes and other accessories.